Will the knowledgeable collector of Greek pots post their collection online? The Italian authorities are keen to reduce looting. They have prosecuted dealers and their suppliers. They have requested that major North European museums return archaeological objects without resorting to the courts. They have also been seeking out objects apparently removed from archaeological contexts in Italy that are known to have passed through the hands of dealers in Switzerland. Through the 1970s, 1980s, and 1990s (and indeed into this millennium) certain museums and private collectors have been more than happy to buy recently surfaced antiquities. Did they ever stop and ask themselves why the objects failed to have any documentation to show that they came from verifiable "old collections"? These institutions and private individuals were happy to buy in "good faith" and ignore the problem of looting. A knowledgeable collector of Greek vases has proposed something more modest. Why can't the Carabineri post images of this material on-line and make it easy for collectors, auction houses, dealers and museums to check whether they have inadvertently purchased artifacts with a questionable provenance? 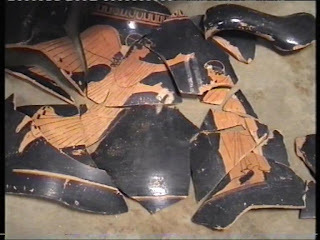 Who is this anonymous "knowledgeable collector of Greek vases"? Will Tompa reveal her name? Or his? Will this anonymous collector of Greek figure-decorated pots post their collection online along with the collecting histories of each piece? Such an action would make it easy for law-enforcement agencies, archaeologists, museum curators, and foreign agents to check whether that collector had inadvertently purchased pots with a less than complete collecting history.